Hey there, Mike here (@MikeFirehammer). 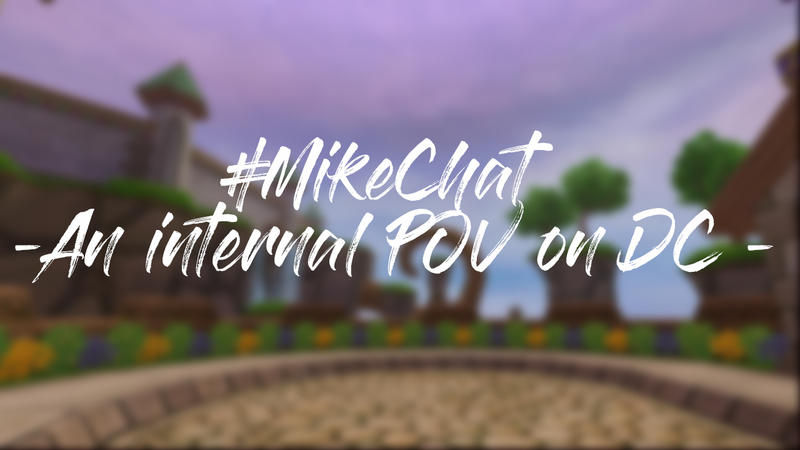 Welcome to “#MikeChat“, a series where I’ll dive into certain DuelCircle topics that the community wants to know more about, discuss some WIP stuff revolving DuelCircle, and share the decision making process from an organizer POV. Check out my last post in this series here! Those of you who keep up with DuelCircle’s semi-annual tournaments know that our tournaments usually feature gamemodes that are in play alongside our general rules each round. We’ve tried out different things over the past 4 years but right now we’re looking at the entire tournament itself and are thinking about how we can streamline the tournament. Basically right now, everything is currently on the table. We’re being extremely careful with how we want to approach this because it’s a tricky grey area. We want to continue looking at statistics and want to conduct more research (potentially through the Fansite Festival and Luau) before we make any significant changes to the tournament itself. As a participant, we want to know how you feel about match length, the amount of time you specifically need for preparations (with and without gamemodes involved), as well as your thoughts on the single-elimination format with best-of-threes designated for the semi-finals/finals. Over the past few years, people have noticed a decline in the amount of participants in each tournament. During our inaugural year, we were capped at the 64 participant maximum with an extremely long waiting list. At the time, if someone were to drop out, we’d continue our lottery system to properly fill in each opening. One of the changes we made in 2018 was the decision to not have any form of art prizing for our top 8 participants. We felt that most of the participants simply were not as interested in the art prizing as much as they had been in 2015. The other key issue that we noticed was the lack of communication between members of the top 8 and the art donors. We tried making an art references channel in the participant discord server but it simply never got utilized. Although some of the artists went out of their way to find each winner, that was part of the responsibility of the winning participant. So for this reason, we decided to shift away from art prizing for now. Even though some of our previous donors still want to support DuelCircle, we’re trying to find an outlet that works well for everyone. There have been tons of complaints regarding X spell not being banned or why X spell is banned. We’re extensively looking at our general rules and monitoring the competitive scene to analyze any specific trends among players. Our goal is to make this as balanced and fair as possible, but not give participants too many restrictions. We plan on being open about our playtesting and we definitely could use feedback along the way. Be sure to keep an eye out very soon for some playtesting streams. As a viewer, how do you feel about the overall experience? Over the years we’ve mainly done the same formatting for each tournament broadcast in terms of promotion, hype videos, and contests. Do you prefer casual chatting by our broadcast team or do you prefer actual shoutcasting? We also want to know how you feel about the schedule itself. Do you like how we’ve split up the tournament into two separate days? We completely understand how it might be annoying to sit through a 30 minute planning period as well. We want to find a solution that’s viable for our participants while not having to simply fill “dead air” time. Give me your feedback in the comments below about this post or about things you’d like to see on #MikeChat. For more info about all things DuelCircle, follow us on Twitter via @DuelCircle_PvP. Mike (Mike Firehammer) is an organizer for DuelCircle events/community involvement. He joined DuelCircle in fall 2016 to work on the development of the Christmas Clash tournament before building a spinoff of the Clash tournament known as 1v1 Luau. Mike is a decent balance PvP aficionado, a not so good Derby player, and has a fetish for Manders. Questions about DuelCircle events or want to chat about Manders? Reach out to him on Twitter via @MikeFirehammer.